Labour and National are entering election year on a war footing. 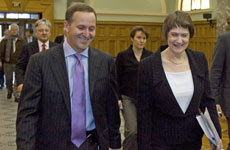 The first shots will be fired next week, when National leader John Key delivers his annual state of the nation speech. But Prime Minister Helen Clark plans a counter-offensive with a major speech the next day, in a significant departure from tradition. The Dominion Post understands 300 invitations have already been snapped up by party faithful for the Clark speech, to be held in Auckland. If you wanted an idea of how deadly serious this election battle will be this year, look at the hard ball Helen is playing now, Labour must have smarted many summers after watching National use the doldrums of no news month to capture headlines, with Helen launching her strategy THE DAY AFTER KEY’S SPEECH, it's time for National to wake up from their sleep walk to victory, Labour mean to win this election. The China free trade deal is like all free trade deals - it is premised on free trade in goods, services, and people. Otherwise you would have an 'artificial trade barrier' against a Chinese company investing in NZ.